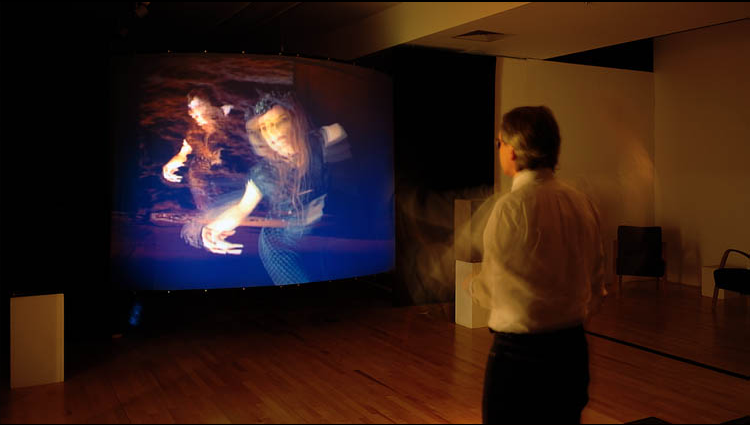 Presented at the Rotterdam International Film Festival (Rotterdam, the Netherlands) in 1998 and within Body Mecanique at the Wexner Center (Columbus, Ohio, United States), Artificial Changelings (1998) calls upon the viewer to activate narrative sections that correspond to the characters’ points of view. Two stories overlap. Arathusa, who lives in the 19th century, is a kleptomaniac who scopes out department stores. Zilith is a 21st-century hacker who appears in a dream of Arathusa’s. A series of zones marked out on the floor indicate the nature of the points of view into which viewers can enter. When close to the screen, viewers get inside Arathusa’s head and hear her interior monologue. If they step back, the character seems to address them directly. The third zone is a kind of dream state, while the fourth level of interaction sends viewers into the 21st century. To access Zilith’s points of view, viewers must step up to the screen again. A position sensor translates the viewers’ motions and triggers the video segments linked to each of the zone markers. Standing still causes the image to stop, whereas arm movement activates the character’s body. With this installation, Dove says she wants to move away from the paradigm of interactivity as a set of pre-programmed, iterative choices, and towards an experience controlled at least in part by chance, where the machine’s responses no longer stem from the viewers’ decisions. The installation consists of a large curved rear projection screen suspended in a room with four zones delineated on the floor in front and some chairs for a small audience. Non-interactive narrative sequences frame the experience at beginning and end. The body of the piece contains multiple segments that offer the audience an opportunity to have a responsive experience with the characters and environment. The viewer steps into a pool of light in front of the screen and enters the interactive zones. When close to the screen you are inside a character’s head; back off and the character addresses you directly; back off again and you are in a trance or dream state; and back off once more to enter a time tunnel that emerges in the other century. Within the zones, movement causes changes in the behaviour of video and sound. There are body, speech and memory segments – each with different behaviors. The characters become like marionettes with unpredictable reactions based on the movement of the viewer in front of the screen. Body movement will dissolve images, shuttle forward and reverse on the time line, trigger frame loops, and change speed and color, as well as dissolve between segments and create superimpositions. Movement close to the screen will produce intimate revelations, close-up images and whispered sounds. Movement away from the screen will create memories clouded by layers of time, transparent images, and washes of sound. The sound environment and emotional tone of the piece are altered as well by the nature of a viewers’ movements within each zone. Different viewer responses will produce different aspects of content and affect. This interactive installation was developed by Alex Noyes on the Max/MSP platform.